Students of tramway history will recall that, not very long ago, many major and even some minor tram systems carried noteworthy freight as well as passenger traffic. Tram tracks were often the best way to access industries that were built away from railway lines. Fuel shortages during World War II gave further incentive to move goods by tram. Yet the subsequent development of road haulage put an end to this activity. Today the practice continues low key in some Eastern European cities, and has recently been revived in Dresden with the introduction of the much publicised tram freight shuttle serving the Volkswagen factory. 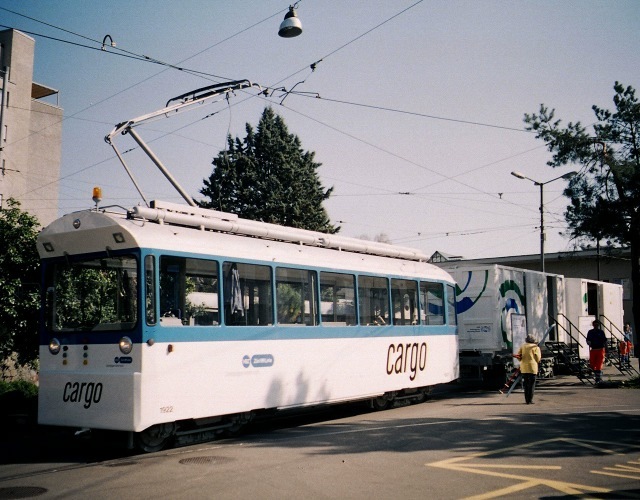 Nevertheless, it came as quite a surprise to learn of the introduction of a freight tram in Zürich. Zürich's urban network never saw much movement of freight, although the interurban lines in their heyday moved cargo ranging from mail to meat, milk and beer. The last such service was discontinued in 1966. So why reintroduce freight trams? 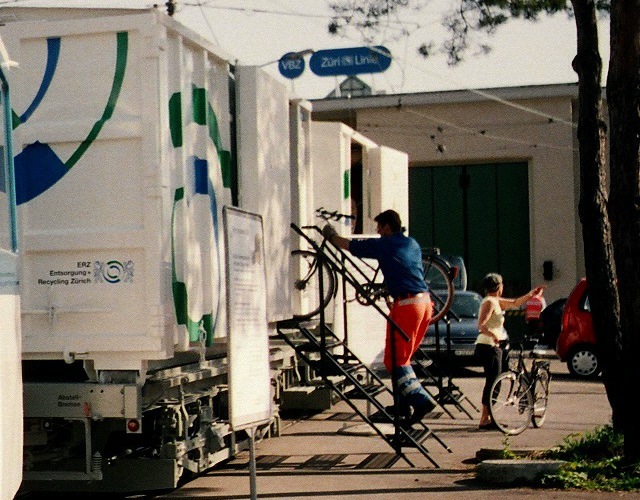 ERZ (Entsorgung und Recycling Zürich) is the city refuse disposal service. In Zürich, items too bulky for the dustcart can be collected at a charge, or left for free at one of the two ERZ yards. Yet 300 tonnes of bulky waste items are dumped illegally every year. ERZ has been brainstorming on how to provide a more attractive yet inexpensive service. Zürich has an extensive tram network serving most neighbourhoods. There are also many suitable sidings not used by regular services. 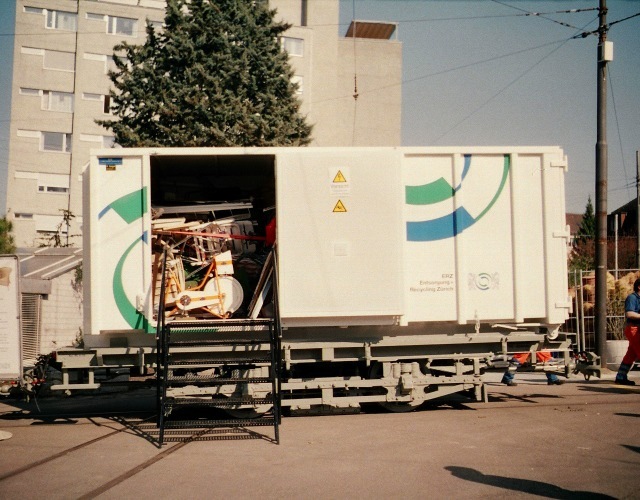 ERZ approached the tram company, VBZ, with the revolutionary idea of using this infrastructure to collect bulky refuse in the neighbourhoods, so making disposal much more straightforward for residents. The idea was met with enthusiasm and Cargotram was born. 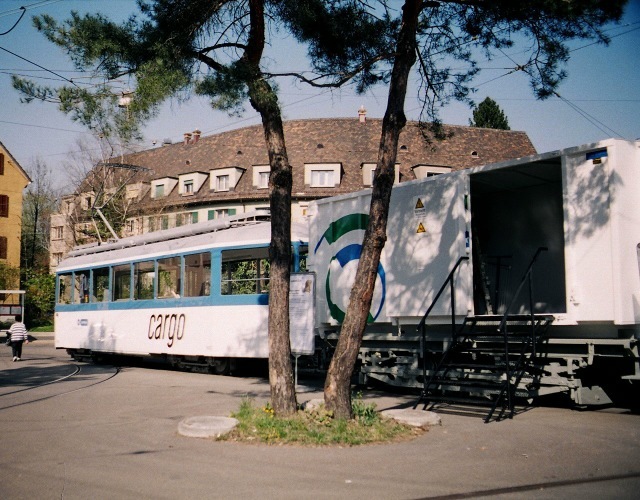 Cargotram took only a couple of months to realise, and cost ERZ some 30'000 Swiss Franks (about £14'000, 20'000€ or 22'000US$). An equivalent road vehicle would have taken much longer to acquire and been far more costly. The key to the low price is the creative use of existing surplus vehicles combined with standard parts. The payload is carried in two standard refuse containers. These are carried on four-wheeled flat wagons. These flat wagons are, incidentally, former works wagons dating from 1929. Their trucks are Peckham originals dating from 1898. The two wagons are hauled by works tram number 1922. This started life as standard tram number 1351 in 1940 and was converted to a snow plough in 1980. It has been repainted in Zürich's traditional blue and white, but with the colours reversed to clearly distinguish it from passenger trams. Cargotram runs four times a month, each time from a different pick-up point. From 3 p.m. to 7 p.m. residents can leave bulky items free of charge. After this, the tram runs to Werdhölzli terminus which is in the immediate vicinity of an ERZ yard. The pilot phase was commenced on 15th April. On that day 7.7 tonnes of refuse were collected, which ERZ considers quite a success. ERZ will be carefully monitoring this trial, which will be completed on 18th December. Then a decision will be taken as to whether the service will be continued or even extended to other destinations. Cargotram not only makes a contribution towards reducing congestion and pollution, it also provides a valuable service to residents. Together with exemplary public transport, attractive local amenities and the 'Mobility' car sharing pool it can be seen as part of a wider concept offering residents a higher quality of life without having to own an automobile. But even beyond this, it is a symbol of innovation which the public can greet with enthusiasm and sympathy: qualities not shared by the unimaginative, noisy obtrusive and polluting road hauled alternative. Zürich has often led the way in innovation. If Cargotram holds its promises, why shouldn't other cities implement similar schemes or other cargoes be carried? I would like to thank Frau Jutzeler of ERZ for kindly answering my questions. This text is based on the article I wrote for Tramways and Urban Transit (published in the August 2003 edition, nr. 788, pp 298-299). This website has an index page collecting Cargotram information. 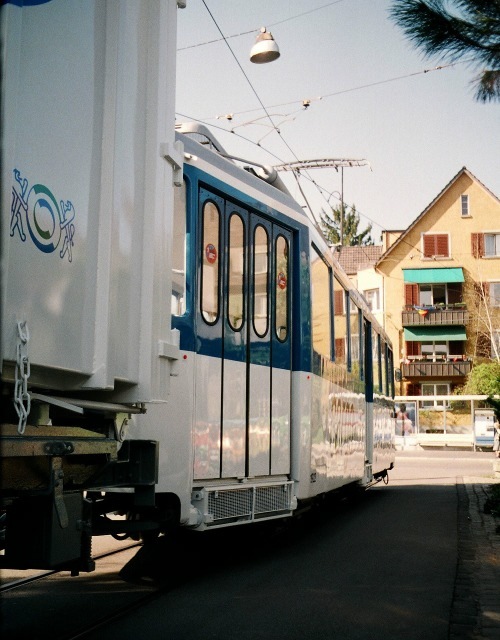 For regular updates and news on Zürich trams in English check: Zürich tram news. Cargotram news items appeared on: 12.11.2003, 16.04.2004, 13.12.2004, 25.02.2005, 04.05.2005, 21.06.2005, 31.11.2005. Search news archive for cargo.